After spending several hours with Howard Royal's mother, I know her as surely as if I'd sat at the kitchen table in the three-room home she and her children built in the upper Skagit Valley 70 years ago. I met Mabel through her words. Decades ago, she filled 75 typewritten pages with the stories of her family's early years. Married in 1907 at the age of 16 to a logger [Thomas Edward Royal], she took her children and followed him from job to job until the day in 1925 when she got tired of the "everlasting moving around". She decided to let him ramble while she and the children built a real home. Howard, now 78, was Mable's second son and the third fo five children. Like his father, he went into the woods at 15 to work and was a logger until his mid-50's. He and his wife Jackie live a few blocks form the Boeing Co's Everett plant in a modest rambler with a small shed out back. A story and photo in The Herald about an old steam donkey unearthed on a steep Skagit County hillside last summer prompted a letter frm Howard. 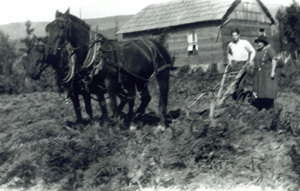 He and his brother Tom worked for Lyman Timber in 1937 bucking windfalls and rode up the 1,000-foot incline each day pulled by a cable hooked to that same steam donkey or "snubber" as he calls it. Sitting at his dining room table we talked about logging in that era and how dangerous it was to life and limb. He shared a few memories of his childhood, then asked if I'd like to see something of which he was very proud. 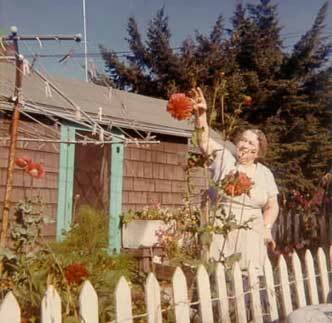 Out back, in that small shed, was a handsome replica of Mabel's homestead, long since gone. The two-holer, chicken house, woodshed, pid shed, main barn and the three-room house. Each built by that mother and her children who spent the first winter living in a tent on their land with no well for water, no electricity and very little money. They did have , however, a 1922 Model T Ford, dreams of a real home and love. "I had to build it while the memories were still with me" he said as we walked back to the house. Howard told me he still had the stories of his mother, who died in 1970, had written for her family. He offered to share them. That's how I met Mabel Royal, a courageous woman and natural storyteller. She bought her 80 acres at an auction on the court-house steps in Mt. Vernon in 1925. It was school land, logged for the valuable tmber and left covered with slash and logging debris. Mabel and her brood, ages 2- 16, spent their first night on the land sleeping under the stars. The next day they put up the old round Army tent that was their home until a real one could be built, the boys set out to find a neighbor who'd let them have water for drinking and cooking. It had been a dry fall. Dried grass, dead ferns,old stumps still smoldering down in rotten wood made those 80 aceas one big fire hazard. "Whenever the wind came up, these old stumps came to life. Sparks from them sailed off, setting grass fires which had to be put out," she writes setting the scene for a terrible day. "It was just about time for the children to come from school. The wind started hitting with heavy gusts...old rotten snags were falling all around. Cindrers from flying sprarks set the grass ablaze," she writes. The pegs that held the guy lines for the tent flew out of the ground one after another. Mable was helping Tom, 16, fight fires, so he had no time to save the tent. That task fell to Howard ,9 , and Jack, 6, who were told to atke a hammer and drive the pegs back into the ground. 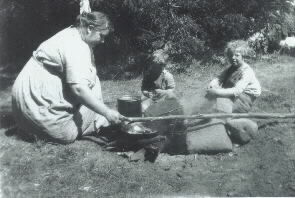 Everytime they did, the wind tore them out again, so Mable anchored tent ropes to nearby logs and stumps. 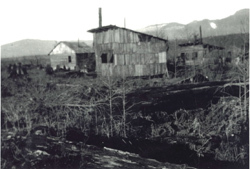 With only a small container of drinking water and no well nor nearby stream, their only weapons to beat down the flames were shovels, a hoe and a gunny sack dampened by that drinking water. The ordeal continued for two days and nights. On the beginning of the third day they saw clouds, and that afternoon, rain. "Oh welcome heavenly rain. Just to know that we wouldn't be chasing sparks day and night was too good to be true," she wrote. The rain came, the tent leaked. When she jumped out of bed the next morning, her feet hit a puddle of water in the center of the tent and she sank up to her knees. Still, she manage to cook breakfast while the children stayed in bed. Then they dressed and crawled out the tent sides to walk three miles to school in Birdsview while she cared for the baby and prepared to move the tent. The forces of nature rarely let up on Mabel and her brood. Windstorms, freezing temperatures, snow, fire, floods-she got them through it all. "There were no sassy brats among them. They were not allowed to fight amoung themselves, either," she wrote of her children. As for herself, she could whistle through her fingers as well as the bous and hike anywhere they could, she wrote. Howard says she was also the chief builder as the house and buildings were erected. Only the flat boards that formed the sides of the house came from the mill, all the rest-shingles, beams, poles- came from their land and their labor. 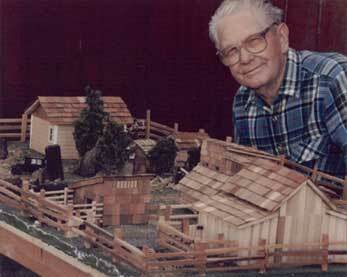 At 10, Howard split shingles for siding on the woodshed, barns and two-holer. His mother's stories, his tapes and the ranch he's re-created may be the greatest legacy Howard Royal leaves to future generations of his family. Mabel and her brood's adventures in the Skagit woods are as exciting as anything a Hollywood scriptwriter's imagination could produce- and they're the Royal truth.